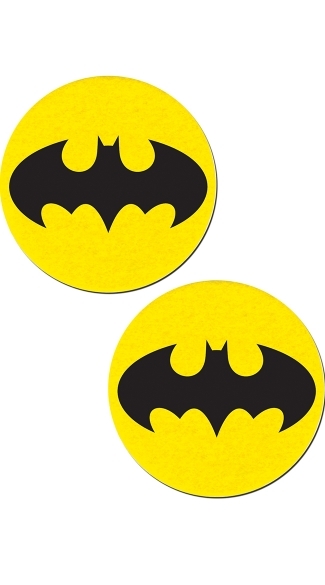 Rock these black bat and yellow circular pasties with any cosplay costume or lingerie outfit! Hand-made in the USA, these no-mess nip covers are made of soft and durable eco-fi material that curves to your breast form and is wrinkle resistant. Just peel and stick on clean dry skin. It's that easy to use!These pasties are latex-free, medical-grade, waterproof adhesive that stay securely in place for as long as you like and until they are gently removed. Coverage diameter is approximately 3 inches.